Critics of the mandate have been arguing for some time that the law, which constitutes the primary government support the industry receives since its tax credit expired last year, should either be reduced or eliminated altogether. It's an eclectic list of detractors. The oil industry doesn't like it because it's a competing product that takes market share away from them. Livestock producers don't like it because they feel it drives up the price of corn, which is used to feed cows, chicken and pigs. Many in the environmental community don't like it either. They doubt whether corn-based ethanol is really any easier on the planet than conventional gasoline, as the land required to grow it results in deforestation. They also feel higher corn prices likely contribute to global hunger, at least marginally. But the industry has its supporters -- namely corn farmers and the big agricultural companies that profit from the higher prices. There's also a contingent of national security types, who like the fact that the 800,000 barrels a day of ethanol produced domestically is 800,000 barrels the country doesn't have to import from the Middle East or elsewhere. That number represents nearly 10% of the country's oil imports. The industry itself notes that, while corn prices have skyrocketed, the price for food is expected to rise just 3% to 4.5% this year, according to the United States Department of Agriculture. "That's pretty close to historical averages," said Matt Hartwig, a spokesman for the Renewable Fuels Association. Hartwig noted that corn used for ethanol produces a byproduct that can still be used for animal feed -- albeit with a smaller calorie content -- and said eliminating the mandate would not bring down prices all that much. Plus, the higher corn prices are already working to drive corn production away from fuel. Hartwig said ethanol production is down 14% in the last two months, but that the decline doesn't place refiners at risk of not fulfilling the mandate. Refiners have build up credits from prior years when they blended more ethanol than the mandate required. Use of the credits was built into the mandate when it was written to help alleviate surges in corn prices. "There are a host of tools available to refiners to meet their obligations," he said. "There is no need to lift the mandate at this time." The mandate is crucial, he said, because not only is ethanol a domestic fuel that's cleaner than regular gasoline, but it spurs investments in advanced ethanol like cellulosic, which can be made from trees or switch grass -- not food crops. In the future, the government requires that more ethanol be made from non-food crops. Nathanael Greene, director of renewable energy policy at the Natural Resources Defense Council, isn't a fan of the corn ethanol mandate and doesn't think it's needed to encourage advanced biofuels. But he cautioned against scrapping the mandate, as it would send a bad signal to investors. Instead, he argued that the government should gradually lower the corn ethanol mandate. 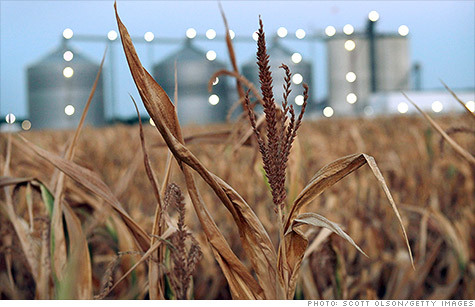 Despite all the talk, analysts don't think the corn ethanol mandate is going anywhere. "Given the potential for political backlash from farm states in an election year and the high bar that EPA applies to granting waivers, " Eurasia Group energy analyst Divya Reddy wrote in a recent research note, "the agency is unlikely to grant waivers for the program."